We finally did it. . .we got a family pet. A hamster. A fancy bear hamster specifically. The kids have been asking for a dog for years, but with all our moving around, then the arrival of our latest, I just wasn't ready to commit to a dog. But recently, I relented -to a hamster. And its been a good thing. 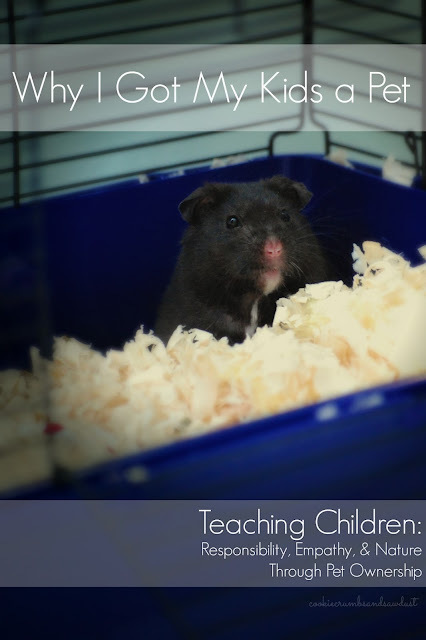 There are lots kids can learn from pet ownership and its been fun watching them learn, grow, and mature as they care for their little pocket pet. Here are the lessons I've noticed so far. My children are in charge of cleaning the cage, providing fresh water and food, and interacting appropriately with little Miss Jordan. And although, they each look forward to cleaning her cage, they're learning the responsibility of having to clean up after her, even when its not fun. She's not just a toy that can be ignored or thrown away when they become bored of her. My children have learned that even Miss Jordan has preferences and those are to be respected. My children can reflect on how they like to be treated and act accordingly to all those around them. Getting a pet also provided an opportunity to research options that would be a good fit for our family. The children learned about the various breeds, behaviors, and needs of different pets prior to our pet purchase. Also, (and hopefully later than sooner) but eventually they'll need to deal with Miss Jordan's death. Part of our research included life expectancy. Eventually our loss will provide a life cycle lesson and experience. They are so many advantages of pets. What are your experiences? And can you believe I was actually able to get a photo of her looking directly at the camera?